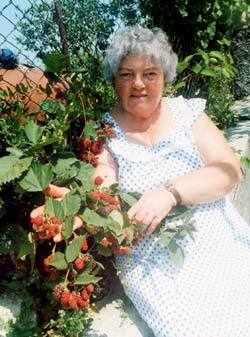 A member of "Demetra" shows off her impressive yield of soft fruit. Trained against a fence, these crops take up minimum space in a small garden. 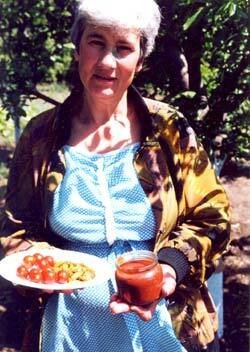 Elizaveta Gavriliuc displays fresh tomatoes from her plot and jam she has made from her fruit. Practical demonstrations held at members' own plots were rated by Demetra members as one of the most valuable activities of the project. 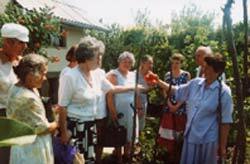 Back in 1999, Transrural was already active in Moldova, advising on the development of community-based enterprises as an alternative organisational model to the collective farms. Our activities were noticed by "Demetra", a new voluntary organisation formed to provide help and advice to people wishing to grow their own produce. There was no tradition in Moldova of independent clubs or societies such as horticultural or gardening clubs, and Demetra members were finding it difficult to know how to structure their organisation and help their members. Their leader approached Transrural to ask if we could help them. Support for this type of organisation fits well with our strategy of developing alternative forms of social organisations as part of the wider development of grass-roots civil society. With funding from Charity Know How (now Allavida), we began a programme with the Demetra committee and members. This was important because most foreign aid to agriculture has been oriented towards the large hectarages. With the demise of collective farms and rising food prices, many people found themselves unemployed, with little hope of adequate state benefits and with minimal purchasing power. Small as they are, household plots hold tremendous potential and can be vitally important as sources of food. Indeed, Moldova possesses the natural advantages of a favourable climate and rich, deep loamy soil (the region used to supply the entire USSR with fruits and wine), but would-be gardeners did not have the skills, knowledge or materials to make best use of their small plots. They could not buy reliable seed, good plants or garden tools. Information was hard to come by. They were missing out on the nutritional benefits of growing their own fresh fruit and vegetables. 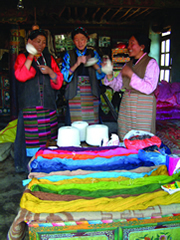 Transrural worked with Demetra to improve and extend its activities. We funded instruction leaflets and audio cassettes; sponsored lectures and demonstration days; and enabled members to research new varieties and access seeds, plants and tools. The emphasis throughout was to promote organic, sustainable practices such as crop rotation to build soil fertility and use natural means of pest control. This was as much out of necessity as principle: most Demetra members could not afford fertilisers or pesticides. We trained the Demetra committee in the skills necessary to run a democratic, member-based organization and worked with them to devise a strategy for the next five years. They were keen to expand and by the end of the first year three new branches had been established in other areas. Membership increased by 45% in one year. By the end of our activities, a total of 243 members were producing impressive yields from tiny plots, using techniques such as "vertical gardening" to make maximum use of space. In members' gardens, squashes, marrows and melons cascaded from trellises and grew through climbing beans. Demetra was ready to grow and grow! Grant funding from Allavida (formerly Charity Know How).